Handlebars are one of the most important parts of your bike. As one of the three “contact points”, the handlebar shape determines whether you are comfortable on the bike or not. After every Paris-Brest-Paris, numerous cyclists complain about numb hands. Some riders take weeks until their hands feel and work normally again. 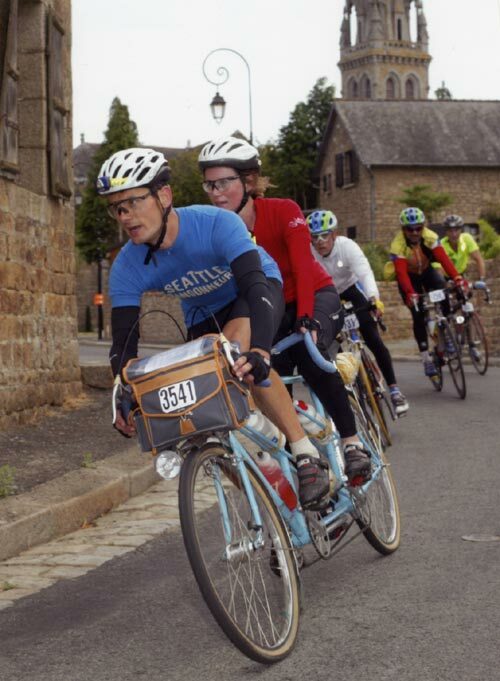 When we rode the 2003 edition of Paris-Brest-Paris on a 1946 René Herse tandem, I realized that hand problems were not inevitable. Despite having to hold onto the bars for 1200 km (765 miles) – riding no-hands on the tandem was possible, but I didn’t do it very much – I had no hand problems whatsoever. The old tandem was equipped with AVA Randonneur handlebars. Ever since, I have tried to replicate that comfort, but currently-available randonneur handlebars did not live up to their promise. The upward curve of the “Randonneur” shape provides three-dimensional support for your hands, rather than the two-dimensional shape of “normal” handlebars. However, to fit into the palm of your hands, the bars must be shaped just right. The upsweep of most “Randonneur” handlebars does little except raise the bars a bit. Many of these models actually are less comfortable than standard handlebars. After a decade of trying many different handlebars, we gave up trying to find a new shape. Instead, we decided to replicate the original AVA handlebars. We made detailed measurements of an original and then had Nitto make us a few prototypes. To test the prototype handlebars, I mounted them on my “Mule” and took them to Japan, where I rode them in a Flèche 24-hour ride. Riding for that long, almost non-stop, at relatively low speeds, meant that a significant portion of my upper body’s weight rested on my hands. At the end, my arms and shoulders were tired, but I had no hand problems at all. This persuaded me to use the new handlebars in Paris-Brest-Paris, where they excelled once more. After this much testing, we were confident to offer them to our customers. With these bars, it’s important to angle them upward, so that the ramps (the top portion behind the brake levers) are approximately horizontal. It is this part that you use most of the time. The brake hood position provides a more stretched-out position, and the drops are lower and even more aerodynamic. Thanks to the large radius of the hooks, I find that hand position very comfortable, too. And the upward angle of the drops may look unfamiliar at first, but it approximates the angle of your hands when riding in that position. These bars have generous dimensions, so that each hand position is truly distinct. It means that not just your hands, but also the angle of your back change as you move your hands between the different parts of the bars. Measured with the bars horizontal, the reach measures 115 mm. It increases when you angle the bars upward. The drop is 140 mm with the bars horizontal. Angled correctly, the reach gets shallower… When angled correctly, both reach and drop work out to about 125-130 mm. 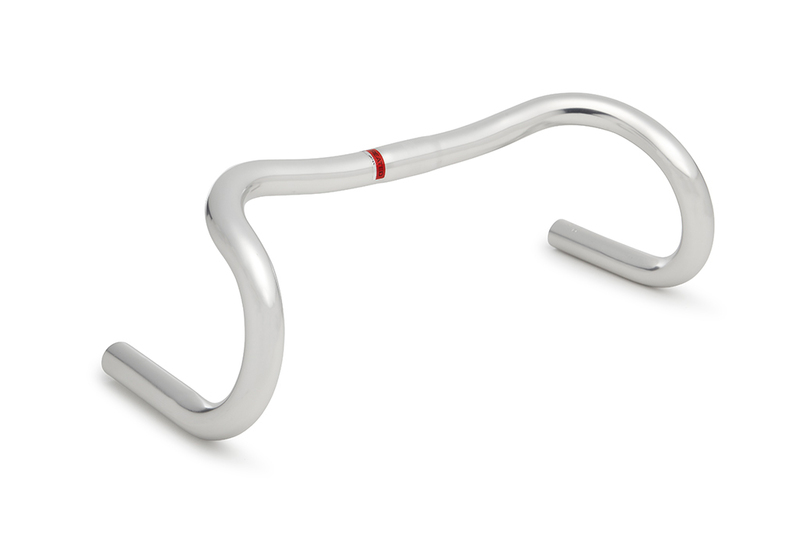 It’s actually a brilliant design in many ways, and it all works out to a handlebar shape that is truly sublime. It’s easy to see now why bars that simply sweep upward from the stem don’t work nearly as well. The photos show the handlebars with traditional brake levers, but they work as well as with modern ones. Modern levers have slightly longer bodies, so your “on-the-hoods” position will be slightly more stretched out. We worked with Nitto to make the new Compass version of these handlebars even lighter than the previous Nitto “Superlight” bars. The “Extralight” handlebars are probably the lightest drop handlebars Nitto ever has made, yet they are strong enough for gravel roads and cobblestones. They are heat-treated for strength. They are available in widths of 400, 420 and 440 mm. We asked Nitto to put our logos on the ends of the bars (as did AVA back then), so they are hidden underneath the handlebar tape. This means that you can use these bars for restorations of classic randonneur bikes, in place of the unfindeable AVA originals. Click here for more information about these handlebars or to order. Will these work well with modern brifters like Ultegra 6800? My current road bike (Riv Roadeo) is using these shifters with a Nitto m178 bar, but am not that impressed when I ride on the tops and am thinking that an upsweep there would really help. Yes, these work with modern brake levers as well as with traditional ones. Modern levers have slightly longer bodies, so your “on-the-hoods” position will be slightly more stretched out. Thank you for asking the question – I added this information to the post. Thanks, Jan. I will probably try these out soon…they look great. A word of warning is that modern brifters are designed mainly for bars with a very sharp bend in the attachment area. This bend is to make the top of the bar flat with the hoods, replacing the ramps. Round bends fit differently. When you mount brifters to bars like these, the levers tend to bottom out sooner than they should. Or more correctly, the shift paddles. A few shims between the bar and the lever below the strap will angle the levers out, giving more useable lever travel. Angling the hoods slightly inward also helps the paddles bypass the bars on the outside. My SRAM red 10 speed shifters work well with these adjustments. Very nice. I would like to put them onto our tandem. Do you think these are robust enough for a tandem? I don’t see any reason why these shouldn’t work on tandems. If anything the shocks a tandem transmits to the handlebars are reduced due to the greater weight of the machine. Do any of the Compass handlebars have cable grooves? It would be good to note if they do or do not. None of our handlebars have cable grooves. I don’t think anybody ever has been bothered by the cables running under the bar tape. In fact, modern handlebars exaggerate that shape (too much for my taste). I first experienced significant hand numbness when I rode a continuous 1000 km brevet on an aero carbon fiber handlebar. It had the flat wing-shaped section in the middle, and I did a log of riding on the tops. My left hand hasn’t been the same since. I now avoid the wing-shaped bars! I agree that those modern wing-shaped bars are not comfortable, but I haven’t had any problems with just a small bulge from the brake and shifter cables under the bar tape. Beyond that, you might want to look at your bike fit. 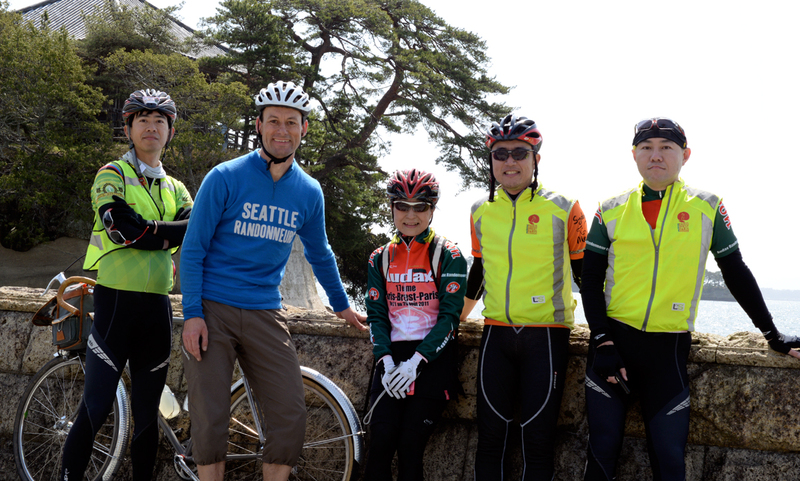 If you ride that much on the tops, perhaps your reach is too long. Help…..How are these different then the GB Randonneur bars? 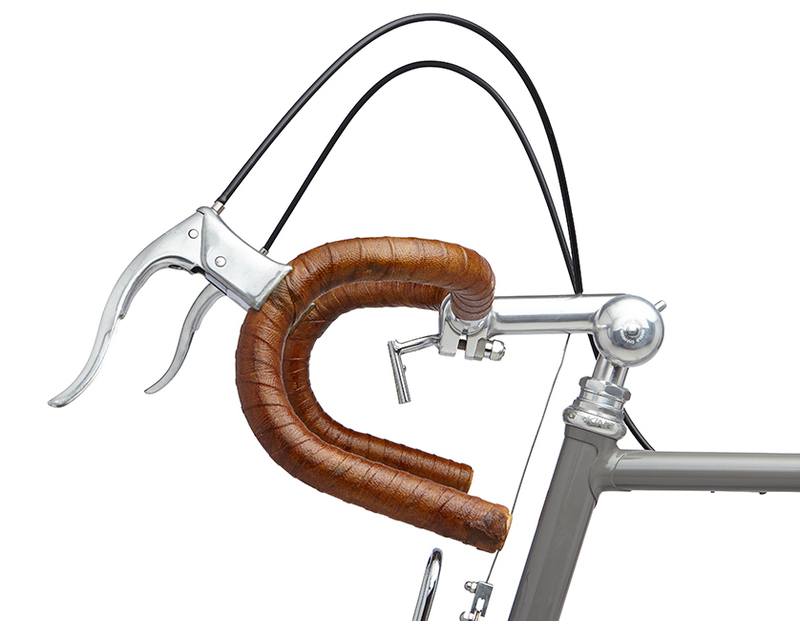 Very different – the Grand Bois handlebars lack many of the subtleties of the AVA shape. The GB bars are nice, but both I and Theo had to take them off our bikes when we experienced hand problems. On the other hand, BQ contributors Mark and Ryan both like the GB Randonneur handlebars. I wonder if Jorge was referring to the Gerry Burgess rando handlebars that came on 1970’s fillet-brazed Schwinns, and which had a GB insignia. Unlike your AVA’s, they are not difficult to find. I hope these are successful and you can offer them with an 31.8 size. If they are anywhere near as good as the Barlow Pass tires, I’d love to have these bars! We offer our Maes Parallel handlebars in 31.8 mm diameter. 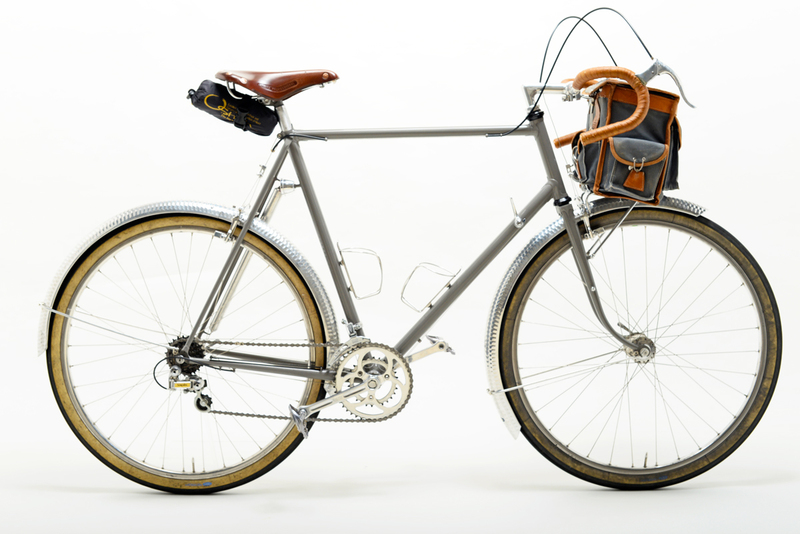 We’d like to offer the Randonneur shape in that diameter, too, if there is enough demand. 31.8 is probably a requirement for carbon fiber handlebars in order to maintain structural integrity for the thinner and thus lighter material. However, I have found that aluminum bars in 31.8 tend to be TOO stiff. I used a PRO alu 31.8 handlebar once on chipseal and my hands, arms, and shoulders felt so uncomfortable that after the ride I immediately removed the bars, replacing them with a hybrid alu/carbon Ritchie handlebar. The PRO bar now is on my track bike, a much more appropriate use for alu 31.8! The handlebars are the same diameter everywhere except in the center section, so the stiffness isn’t very different. It may be that just the individual bars you tried in 31.8 mm were stiffer than the others you are used to. The “superlight” bars are made from thinner material, so they are the least stiff – something that might be a concern for track sprinters, but a benefit for the rest of us! What are the differences with the Grand Bois Randonneur handlebar in Compass catalogue ? I remember an old post where you already explained that it was a copy of the AVA. Is this new handlebar a lighter version or is the shape different ? We were told at the time by Grand Bois that their bars were a copy of the AVA shape… and since the originals are so hard to find, we couldn’t compare. When we finally did ride them back-to-back, we realized that there were many subtle differences. So we investigated further… and the new bars are the result. I recently returned from PBP with the numbness you describe. Unfortunately I am familiar with the phenomena and have learned that points of contact are part of the picture. The other cause seems to come from the angle of the wrist and its effect on the carpal tunnel. So maintaining a neutral wrist angle is important. How do these bars fare in terms of wrist angle? Along these lines, an in-depth article on cyclists palsy would likely help a lot of riders with this vexing issue. Maybe a better question is whether there would be any problem using a commercial shim for use with a 31.8mm stem. I’ve been intrigued by randonneur style bars recently for their upward bends and curves. These look to be the best yet. I do have a question though. I’ve spent much of my time on flat bars and finds myself routinely using the flats on drop bars. Is it possible to use the flats comfortably on these bars since the flats curve upward? What kind of stem do you need to use these bars on an Ahead threadless fork? My current bars are all 31.8mm. Aheadset stems are available for 25.4 mm handlebars. Velo Orange has a reasonably good selection of 25.4mm clamp threadless stems. Pretty, light, decently priced, more than acceptable quality. Haven’t found a better place for classically styled stems for threadless forks. Jan, could you please tell us how and where the bar width is measured, and also the width (C-C) where the brake levers attach. Thanks. The widths is measured at the drops (bottom), center-to-center. The tech specs on the Compass web site also lists the width at the top. The width where you attach the brake levers will be roughly half-way in between, depending on where you attach the levers. Thanks Jan. Seems like the 420 bars should be the right width at the hoods for me. The only randonneur bars I’ve used were SR, and they were 420 C-C at the drops but only ~360 at the hoods. I’m currently suffering hand problems after PBP too, probably largely Ergopower related, but the bars may have been a contributing factor. Yes, these don’t flare as much as many others. I am not sure why some makers flare their handlebars so much. With a very long reach, you need a little flare to prevent your wrists from hitting the upper curves when you ride in the drops, but it needn’t be excessive. Could you compare and contrast the shape of these new bars with the similar Grand Bois Randonneur bars? The curves are different. A curve that doesn’t fit your hand (most “Randonneur” bars) or one that “almost” fits your hand isn’t as good as one that does fit your hand. Beyond that, the AVA shape accounts for the fact that these bars should be rotated upward, so the reach is shorter and the drop deeper when they are flat, but when you tilt them, they become perfect. How do these compare to Nitto’s Noodle bars, as judged for comfort among your panel of users? The Nitto noodle were a first attempt to get flat ramps, like the old Philippe Professionels (and their modern copies, the Compass Maes Parallel). The shape of the AVA/Compass Randonneur handlebars is much more complex to provide better hand support on the ramps. And of course, the Noodle is Nitto’s budget handlebar, and much heavier than the Compass bars. Think Shimano 105 vs. Dura-Ace… both made by Shimano, but to different quality standards. Our handlebars don’t have the backward sweep. I never could figure out what the backward sweep was supposed to do. Perhaps compensate for the longer ramps? I prefer getting a slightly shorter stem, if needed. I like a slight backward sweep; it’s how my hands naturally fall when I extend them to grab the bar. A straight top pushes my elbows out a bit. Interesting! For me it’s the opposite: When riding on the tops, my elbows are further apart than my wrists. So the backwards sweep of the Noodle bars is not very comfortable. I’m wondering if the back sweep of the Noodle bar is an attempt to compensate for the generally long reach of the bar on the ramps compared to a typical modern bar. I absolutely love the Noodle and can’t stand the typical modern bar. Haven’t tried any of the bars from Compass but if I did I’m wondering if I would have to get a shorter stem. I think that is the reason. However, I find that I prefer to keep the stem almost at the same length, since I mostly ride on the ramps. The hoods then provide a more aerodynamic position, and the drops an even lower one. And the tops stay where I need them. How wide is the center bulged section? I’m looking at my 31.8mm stem thinking that it could be OK with a shim if the center section of the bar is at least as wide as my clamp. The bulge is about 35 mm wide. Any plans on a bit more shallow drops for women/more tiny people (130 max, type TTT Morphe), especially since you are building 40 cm wide bars (which is my own maximum)? Oh, and you say that those bars are different that the GB but did not elaborate: I found for instance that the angle of the “horizontal” part of the GB was twisting my wrists. Would you kindly show us a picture of the bar as seen from the cyclist’s point of view, angled as you advise? Thanks! the problem with the non-sleeved center combined with many threadless stems is that they tend to crush the clamp area of the bar when tightened to the where they don’t slip. This is a function of the hollow stem end that clamps the bar which severely limits the area that makes contact, thus it starts to dig into the bar. Happened on my GB rando bar. A sleeved clamp are would be much preferred. What make and model of stem was it? One stem that could probably crush bars is this old Shimano design. The hidden binder bolt pushes a foot against one side of the bars. If you don’t get the bolt tight enough the bars rotate and round off the teeth on the aluminum foot, after which the stem will never hold the bars secure. http://www.peterwhitecycles.com/stems.asp. Was a deda newton stem. Crushed carbon bars are not uncommon. A simple sleeve would fix the issue. Used 24.5 to 31.8 shims for the next GB rando bar to provide a more even clamping surface. It worked but was inelegant. Now I use PRO vibe7 round bars in 31.8. A sleeve is a cheaper way of making bars. Rather than swaging the diameter down from 25.4 mm to 22.2 mm, you just put a sleeve over the center. The disadvantages are a) added weight and b) a stress riser at the edge of the sleeve, which means you cannot use the sleeve with a superlight bar. I use the Deda Newton 26 stem with Deda 215 anatomic bars on one bike and with Nitto dreambar on the my cross/brevet bike. Not all combinations were even though the measurements (26 mm) of stem and bar should be the same. The point being that with the Deda Newton, You should not exceed 6Nm torque, and if that does not hold the bar in place, then You can not use that combination. I have a question which is not related to handlebars. On your bike, you seem to use a threaded headset with a clamped Rene Herse style stem. I assume you also use an expander bolt. So my question is : how do you run the wires to the cap light switch through the expander bolt ? Thank you very much if you take on your time to answer this. With a careful choice of tools, they can be stashed in all sorts of otherwise empty parts of the bike; Sunbeam used to supply an oil gun and a compact toolkit, one in each end of the handlebar. Faure also put his wrenches and tire lever into the end of the handlebar. They were attached to the bar plug and folded out like a Swiss Army knife… Really cool solution. Good solution, light and reliable, but if you want to rinko your bike the steerer is a bit longer (no longer that with a threadless headset). Thank you for taking on your time to answer all our questions. How to translate all the features of my favorite bike into a Rinko-compatible package is something I am thinking about. It’s not easy, because there are many things to consider. These bars will be on my list of future upgrades. If I can find a long enough stem. I think I have done permanent damage to my hands over the years, my little fingers always feel as if they sleep. I usually get problems with my hands on brevets. Only on this years P.B.P I had none or almost none. The only thing I changed was the tires. I switched to Stampede Pass and rode them with 4 bars in the front tyre, 4.2 in the rear tyre at 100kg rider-bike-etc. Apart from rolling like a dream, It also gave only were little soreness behind and as said no problems with my hands. Can I please ask a question on a slightly different topic? I wore the prototypes for the new Compass cyclotouring knickers for the last 450 km of PBP. They worked great, and they didn’t seem to slow me down. They are being manufactured here in Seattle right now. They turned out to be much more difficult to sew than anticipated, but we hope to have them sometime this month. Do they have a chamois? No chamois. You wear cycling shorts underneath. Two reasons: 1. A chamois with loose-fitting pants will not stay where you need it. 2. You can wear these off the bike. I find them ideal for hiking, too. The Mule, painted, looks terrific. Beautifully utilitarian. 25.4 clamp only? Shaking my head. 25.4 mm works with all stems – you can shim to 26 mm or 26.4 mm. (You cannot reduce the diameter of the bars.) We carry Nitto’s excellent shim to use these bars with 26.0 mm stems. Furthermore, the original AVA were 25.4 mm, and many people will use the Compass bars for restorations of classic bikes. Most of the AVA handlebars I measured when I did restorations of classic French bikes as a bike mechanic in the early 1990s were 25.0mm (25.2mm at most). Even back then it was difficult to obtain matching replacements for some French parts, so we saved the few NOS AVA handlebars we had for those special occasions, and replaced the stem along with the bars on the lesser bikes. Some wholesale dealers still had nice stems with a 22.0mm quill and 25.4mm clamp diameter in stock, so ordering one of those was the easiest option. Some customers even asked us to do so, partly because AVA stems were prone to failure, partly because they wanted to replace their handlebars with something more modern (or fashionable, or comfortable). The AVA company that made the original randonneur handlebars in the 1940s was owned by Mavic. Beyond the name (sold by Mavic? ), there was no connection to the maker of cheap stems from the 1970s. All 1940s AVA Randonneur bars I measured were 25.4 mm, which was a surprise, since French handlebars usually measure 25.0 mm. Maybe AVA used tubing sourced from the UK or USA. They look great! Look like a useful improvement on the other models out there. What are your sizing recommendations? Would you recommend most people give the 400mm ones a try in view of your handlebar width article? I’d say pick a width you are comfortable with… I rode the 400 mm wide version in PBP, because they are more aerodynamic. When I first get on the bike, I can feel the difference to 420 mm that I have on the Mule, but after a few hundred meters, I cannot tell the difference in how the bike feels, and as far as comfort goes, the different widths make no difference to me. The post on handlebar width can be found here. Hi Jan — I’m not sure I recognize that stem — is it a tapped Nitto Pearl (for the bell) or some other stem that Compass does not offer on their website? Nitto NP (formerly Pearl) drilled for brake cable and bell. How much weight do you carry on your mule (I am reffering to the pic when fully loaded)? 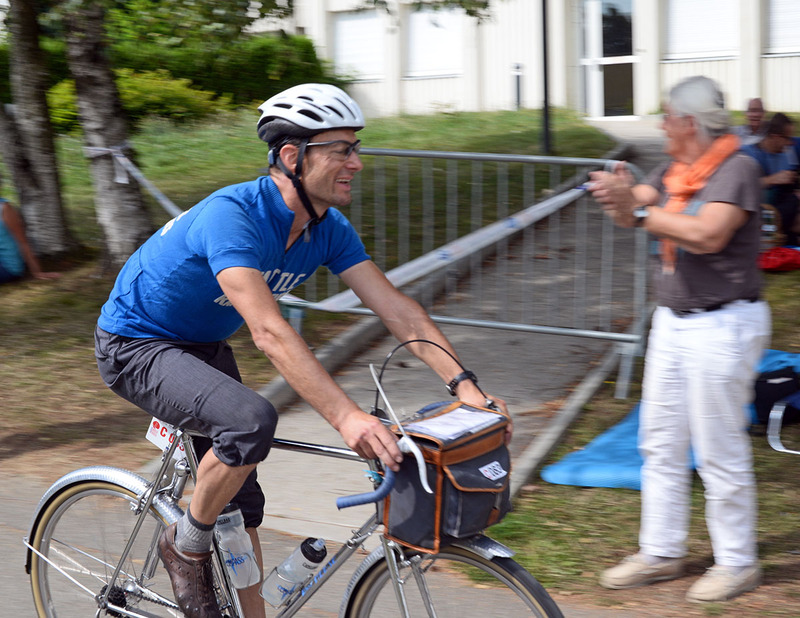 Those GB panniers look like they are going to burst! Why did you decided not to add eyelets for a rear rack? 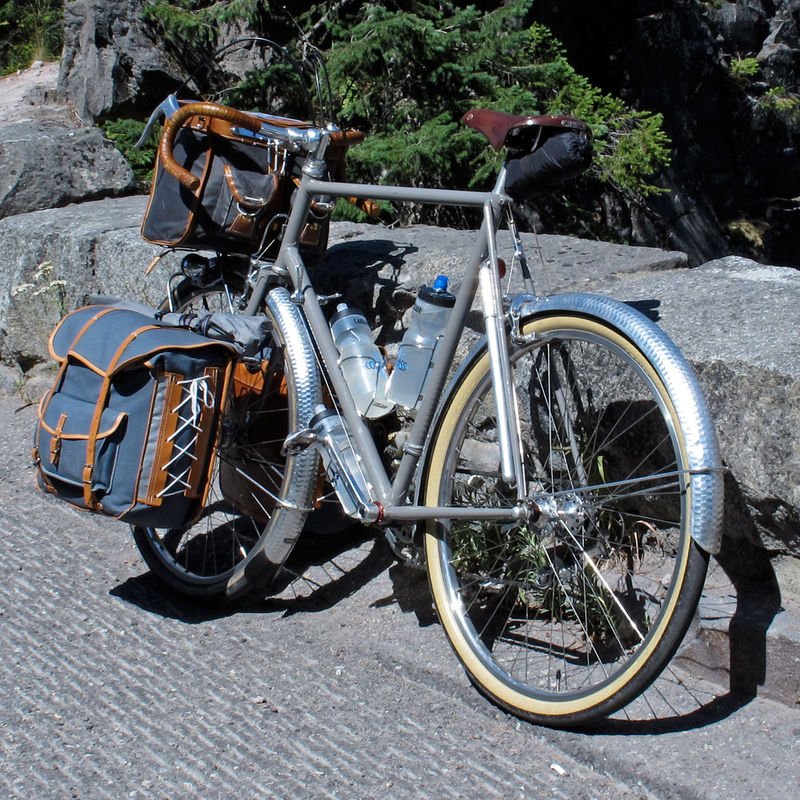 Regarding panniers, which type of low rider do you use ? I made the rack based on a 1950s René Herse design. I think the Mule carried about 40 pounds on that trip. It was quite some time in the back country. With a superlight frame (chosen for its flex characteristics/planing, not its light weight), a rear rack is a bad idea. Generally, I prefer a front load, since it doesn’t affect the bike’s handling much, over a rear one that is harder to balance and slows the bike’s reactions. What is that thing that is brazed onto the decaleur on the Mule bike?